By now I probably have you convinced that the only meat we eat in our house is chicken. I swear it’s not! We really do eat a diverse selection of meat. I just find that those are some of my more creative recipes that are fun to share. Well I’m breaking the chicken trend and sharing a fabulous pork recipe. This is a super decadent way to enjoy a very simple cut of meat. The creamy mushrooms are rich and completely addictive. I thought they went wonderfully with some mashed potatoes. This is one of those recipes that completely knocked my hubby’s socks off. One of those meals where there is minimal dinner conversation because you are just taking bite after bite, and moaning every few minutes because you are full but you just can’t stop eating. If you are looking for one of those kinds of dinners, this is it. In a shallow bowl whisk together egg and water. Season both sides of the pork chops with salt, pepper, and paprika. Dip the pork shops in the flour being sure they are coated evenly. Then dip the chops in the egg wash and breadcrumbs, coating completely. 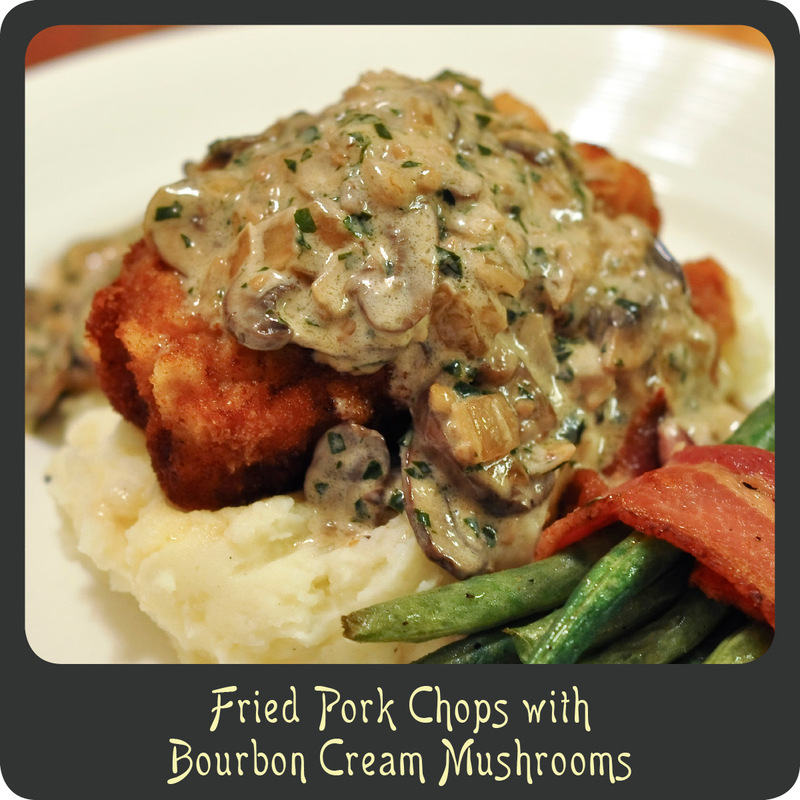 Set the breaded pork chops aside. Heat 2 tbsp of the olive oil in a medium skillet over medium-high heat. Sauté the onions, garlic, and mushrooms until browned, about 10–15 minutes. Add the wine and increase the heat to high. Boil the wine down until all the liquid is reduced to almost a glaze, about 4 minutes. Add the chicken broth and the bourbon and simmer until reduced by two thirds. Add the cream and simmer several more minutes, reduce heat to low. In a large skillet heat the remaining four tablespoons of oil over medium-high heat. Add the pork chops and cook 4 minutes per side or until they reach a nice golden brown. Transfer the pork chops to a baking dish and cook for another 8–10 minutes or until cooked through. Remove the pork chops from the oven and allow to sit for a minute. While the pork chops are resting turn up the heat on the mushrooms and add the chopped basil. Season with salt and pepper and spoon over the cooked pork chop.